The Maine Department of Environmental Protection (DEP) and the Land Use Planning Commission (LUPC) are the state's primary regulatory agencies responsible for evaluating potential environmental impacts associated with development projects in the organized and unorganized jurisdictions, respectively. When a proposed project may affect wildlife resources, DEP and LUPC generally solicit MDIFW regional biologists and species specialists for recommendations for avoiding, minimizing, and mitigating wildlife impacts. Pre-application screening is a process whereby landowners, developers, and/or consultants contact DEP, LUPC, or MDIFW prior to formal submission of a project permit proposal. It can save time and money by allowing a project to be modified to comply with environmental laws before significant investment has been made. Potential applicants can consult directly with an MDIFW regional biologist or channel their request through DEP or LUPC. Alternatively, an applicant can hire a private consulting firm to work with state agencies to determine potential impacts. Many of these firms have access to MDIFW's wildlife/habitat data. "Avoid, Minimize, Mitigate" - ideally projects should be designed to avoid any negative impacts to priority wildlife resources. 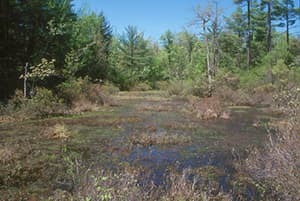 Where such avoidance is not possible (for example, if the project site is entirely within a protected habitat), then MDIFW regional biologists and species specialists can help applicants modify their proposed projects to minimize impacts. Examples include changing the timing of an activity, consolidating and segregating development from designated open-space areas, implementing enhanced riparian or wetland buffers, reducing the project's total landscape footprint, or modifying the materials, methods, and equipment used. If impacts to wildlife resources cannot be adequately minimized, an applicant may be required to mitigate for those impacts. As a last resort when none of the above alternatives are possible, a permit may be denied by DEP or LUPC.